These are stories that have been told and retold. In this telling, each cookie highlights a child with a journey under terrible circumstances, circumstances that they themselves didn’t create, but endure. In these tales we consistently hope for a positive outcome for each child. We hope the children are assisted. That they are persistent. That they are resilient. That they reach a place of safety and even a happily ever after. These children come from a place that is everywhere and nowhere. It doesn’t matter to whom these children “belong”. We want them to survive and to thrive. This project was initially inspired by the children who are fleeing the violence of the drug war and showing up unaccompanied at our southern border. Their desperate and dangerous flight is one in which we are accomplices. They didn’t create their hell, yet they are carrying the harshest consequences. From there, the project expanded to include the displaced children from all over the world. More people are currently on the move than ever before. Articles and horrific imagery flash across our screens until we hardly see them anymore. This project is an attempt to view this crisis from another lens and to process this tragedy in an intimate way, a way that connects us to our own childhoods and asks us to embrace these children as our own. Our hopes and our greatest fears. I decided to tell these stories through the nurturing act of baking cut-out cookies. Something that those of us with a home and a kitchen stocked with the “basics” can create for those we love. An act that we take for granted. An act that we associate with celebrations and togetherness. Cut-out cookies appeal to all of our senses: their aroma, their taste, their warmth and their whimsy. Cut-out cookies are special. They are meant to be tasty and their shapes are meant to delight us and to spark our imaginations. They are vulnerable and temporary, like childhood. In these pieces the protagonists are “cut-out” and can therefore be any child, every child. Each piece is accompanied by a recipe card to provide some context for the story. This project in no way diminishes the need to hear and listen to the stories of those who have been displaced. It is instead intended to remind us of our humanity, our shared vulnerability and our shared responsibility. 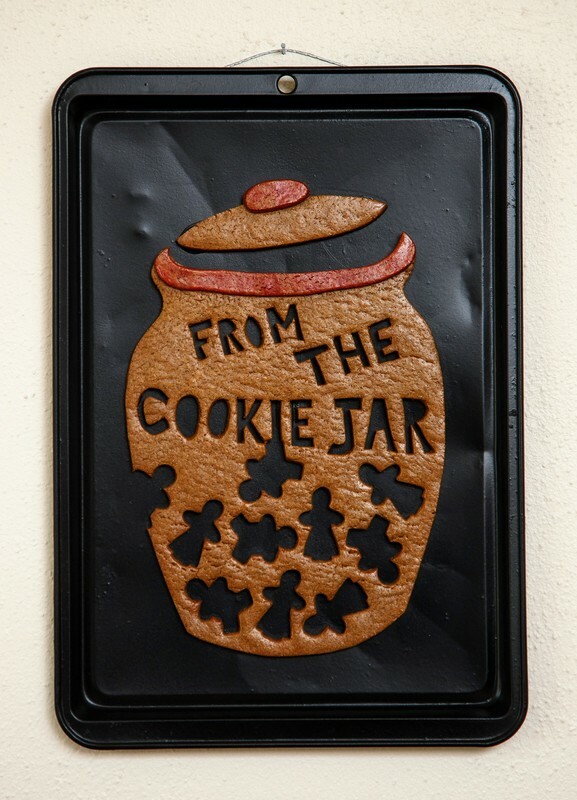 Welcome to this kitchen and see what’s in the cookie jar.